The live Oak Lawn provides a tree-shaded space for large events. Be it a wedding, a benefit, or a garden party, the versatile spaces create opportunities for various size tent configurations. One area is bounded by a brick lined patio perfect for a cocktail area, bandstand, or ceremony site. The Pierce Ranch House Compound contains all of the buildings offered for day use rental, including the Pierce Ranch House, the Hog Heaven Pavilion, the Play House, and the Milk House. The pool and tennis court are also included in this space. The compound can be used by all of our guests in a myriad of different ways. It is also the site of intimate weddings of up to 100 guests. *Dogs allowed in kennel or crate ONLY. The pond and polo field present unfettered space and possibilities for events. An open area of over twenty acres could host a clay pigeon shoot, dog trials, soccer tournament, kite flying, bonfire – the options are endless! There are also incredible sunset views under the grove of oaks by the side of the pond. This is the original, historic house built in 1886. It is located in the middle of the PRH compound. It is a lovely home, with gracious common areas and a commercial kitchen. This house is located a two minute walk from the PRH compound. There is a large living room, pool table, and full kitchen facilities. This is a rustic lodge, located a fifteen minute drive from the compound. There is a large living/dining area, pool room, and a full kitchen. There are five bedrooms with dorm-style twin beds, and three shared baths. Also available for day-use rental. The headquarters of Shanghai’s cattle empire has served many purposes over the generations, as it does in our venue. In addition to leading the lodging options, the Pierce Ranch House can also be rented for dinners, parties, and meetings. The sumptuous common areas can house up to forty guests between the living room, formal dining room, and gallery porch, which can be opened up to the patio for more space. Seated meals for up thirty can be configured as well. This building is an open air, covered space measuring 25x 33. 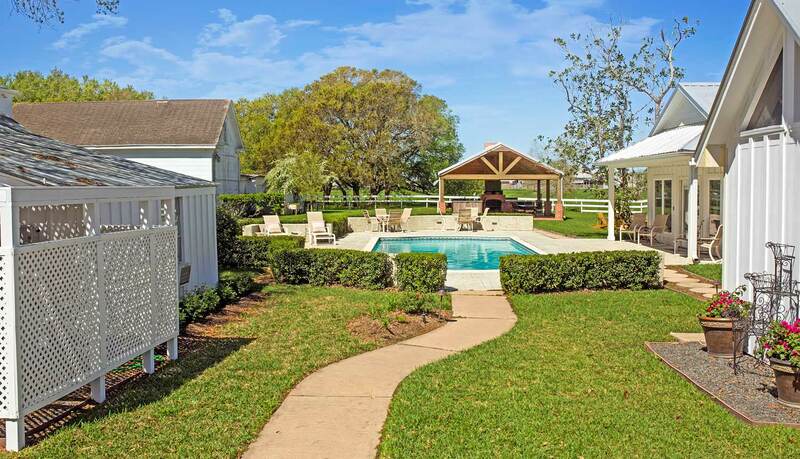 It is a perfect place to enjoy outdoor entertaining, with views of the horse pasture beyond the compound fence. Set within the ranch’s original smoking fireplace, there is a gas grill, a charcoal grill, wet bar, and big screen TV. For stargazing, the fire pit is just steps away from the pavilion. This is a lovely 25 x 25 climate-controlled space with plenty of natural light. Furnished with comfy couches, it can easily be converted into a meeting or dining area. There is a full kitchen with a serving island, and floor-to-ceiling windows. It is perfect for corporate events, family gatherings, and serves as the bride’s lounge for weddings. Think of this as the Pierce Ranch man cave (though women are welcome!) Draw the curtains and play pool or poker to your heart’s content. Complete with wet bar, big screen TV and half bath, this room is perfect for post-hunting relaxation, and it serves as the groom’s lounge for weddings. Great for bachelor parties too! This is a rustic lodge, located a fifteen minute drive from the compound. There is a large living/dining area, pool room, and a full kitchen. Prices upon request. Also available for lodging.